When I meet a CEO or executive who tells me they me they are "too busy", they are saying they are not doing the things they should be doing. Priorities are driven by others, their day is chaotic and "less important" things such as exercise, family and time to focus hit the back burner. 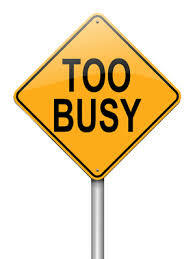 Too busy means unproductive, unfocused and ineffective. In a one-to-one yesterday with a Vistage member, we took time to process this issue. I've listed a few of the bullet points that came out of that meeting. If you are experiencing excessive busyness, maybe we need to talk. Keep Monday and Friday as interaction day. Reduce or eliminate meetings on these days.